White nationalist spotted at Kris Kobach for Governor fundraiser in Washington, D.C.
Kris Kobach appears to be associating with white nationalists again. Less than two weeks after citing holocaust denier and racist Peter Gemma in his Breitbart column, Kobach held a fundraiser in Washington, D.C, for his Kansas gubernatorial campaign. 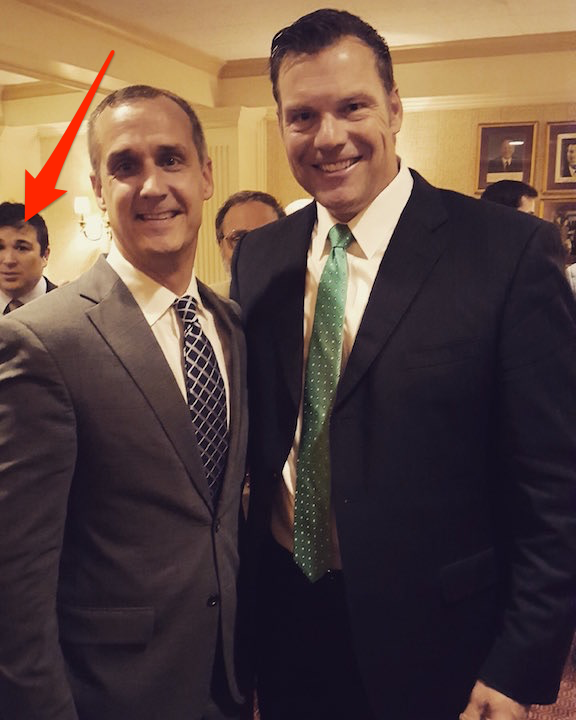 At the November 3 event, Kobach posted a photo of himself on his Twitter account with former Trump campaign manager Corey Lewandowski. Behind both men, clearly visible, is longtime white nationalist Marcus Epstein. Marcus Epstein, rear left, attended Kris Kobach's fundraiser on Nov. 3. Epstein has been active in the white nationalist scene for over a decade and even has a past history of racial criminality. In 2009, he pleaded guilty to assaulting an African-American woman in Washington, D.C., two years prior. His appearance at Kobach’s fundraiser is another indication that the Trump era is serving to rehabilitate not only the ideas once relegated to the racist fringe, but also the careers of movement members. It also underscores the social and political circles that Kobach has long moved in. Epstein had a hand in founding two now defunct racist groups. In 2006, he, along with white nationalists including Kevin DeAnna and “alt-right” leader Richard Spencer founded the Robert A. Taft Club. The Club, described as, “a monthly meeting group of traditionalist conservatives and libertarians in the Washington, D.C. area,” hosted guests such as Ron Paul, Charles Murray and Jared Taylor, one of the most prominent racist figures of the past three decades. The Taft Club eventually dissolved in the late aughts. Epstein again teamed up with DeAnna in late 2006/early 2007 to help run the Youth for Western Civilization (YWC). YWC was white nationalist student group whose chapter leaders have gone on to become key figures on the radical right. The group’s chapters held a number of events on campuses across the country designed to stoke racial tensions, including erecting a mock border fence at Washington State University, and a organizing a “Straight Pride Day” at Towson University in Maryland. The Towson chapter was founded by Matthew Heimbach, a white nationalist who now runs the Traditionalist Worker Party, a group intimately tied to neo-Nazis and extremists. Marcus Epstein (right) with alt-right leader Richard Spencer (left) circa 2011. For a number of years, Epstein worked with white nationalist Pat Buchanan, a former presidential candidate who many younger white nationalist activists, including YWC leadership, have cited as a major influence. In the mid-2000s, Epstein served as executive director of Buchanan’s American Cause, which at the time organized gatherings of right-wing activists to discuss topics including immigration. Epstein also served as executive director of Team America PAC, a PAC dedicated to electing right-wing politicians founded by Buchanan’s sister, Bay, and nativist icon Tom Tancredo. Epstein resurfaced in 2011 when Buchanan thanked him for his “invaluable assistance and untold hours he devoted to researching ideas, issues, and anecdotes” in helping Buchanan write his book, Suicide of a Superpower: Will America Survive to 2025?. Nativism plays a large role in Buchanan’s book, and it has been the core element of Kris Kobach’s agenda for years. For over a decade, Kobach has worked as counsel to the Immigration Reform Law Institute (IRLI), the legal arm of the Federation for American Immigration Reform (FAIR), one of the oldest anti-immigrant hate groups in America. FAIR has historical ties to white supremacists and eugenicists and who have made numerous racist statements. FAIR and IRLI’s founder is white nationalist John Tanton, a man who in 1993 wrote, "I've come to the point of view that for European-American society and culture to persist requires a European-American majority, and a clear one at that." During his tenure at IRLI, Kobach has been responsible for helping to draft some of the harshest anti-immigrant legislation in the country, including Alabama’s HB56 and Arizona’s SB1070. In October 2015, Kobach was a featured speaker at the annual Writers Workshop put on by The Social Contract Press (TSCP), which regularly publishes the writings of white nationalists. Its journal, The Social Contract, has published four articles from Epstein. TSCP is a project of another foundation, U.S. Inc., created by FAIR’s Tanton. When Kobach ran for Congress in Kansas in 2004, he received $10,000 in campaign contributions from U.S. Immigration PAC, which was operated by FAIR founder John Tanton’s wife. It is unclear if Epstein had to donate to the Kobach campaign to attend the fundraiser.